Adding or Dropping signals of devices on the existing WDM network is very common to service providers. Adding a new fiber optic cable for signal transmission of the devices would cost too much. The using of OADM (Optical Add-Drop Multiplexer) solves this problem easily. A OADM can couple two or more wavelengths into a single fiber as well as the reverse process. Service providers can save a lot of money and installation time by adding OADM into the existing WDM network, if they want to add or drop signal on a single fiber. OADM is generally deployed in WDM network which includes CWDM (coarse wavelength division multiplexing) and DWDM (dense wavelength division multiplexing). Thus, OADM can also be divided into CWDM OADM and DWDM OADM according to its applications. During the selection of OADM, the fiber count that a OADM should be considered. The most commonly used CWDM OADM can add or drop fiber count of 1, 2 and 4. For DWDM OADM, the fiber counts are usually 1, 2, 4 and 8. The installation environment should also be considered during the selection of OADM. There are mainly three types of OADM with different package form factors: plug-in module, pigtailed ABS box and rack mount chassis. The plug-in modules can be installed in empty rack enclosures. The following shows three CWDM OADM with different package form factor. 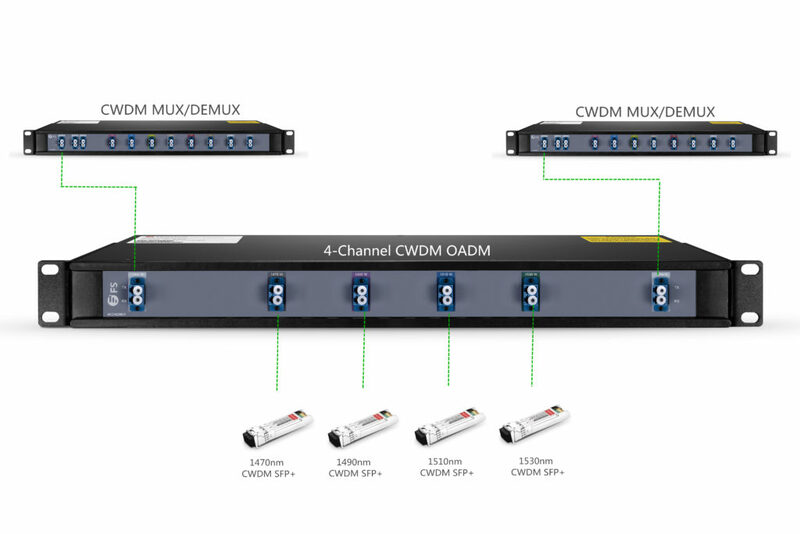 In most cases, OADM is deployed with CWDM or DWDM MUX/DEMUX. 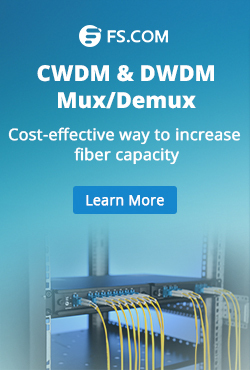 It is usually installed in a fiber optic link between two WDM MUX/DEMUXs. The following picture shows a CWDM network using a 1-channel dual fiber OADM between two CWDM MUX/DEMUXs. Signals over 1470 nm are required to be added to and dropped from the dual fiber link. On the OADM, there are usually one port for input and one port for output. 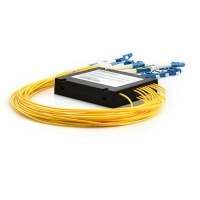 The OADM can be regarded as a length of fiber cable in the fiber link. The point is the one or more strand of signals is added or dropped when the light goes through the OADM. To better illustrate the using of OADM. Here takes the example of a 4-Channel CWDM OADM. This 4-channel OADM supports wavelengths of 1470nm, 1490nm, 1510nm and 1530nm. West port is connected to a CWDM MUX/DEMUX and the East port in connected to the other CWDM MUX/DEMUX on the other end of this fiber link. Up to 4 different wavelengths of optical signals can be added or dropped. The four Channel ports can be connected to the corresponding CWDM transceivers installed on switches. Then a CWDM fiber link with OADM is finished. 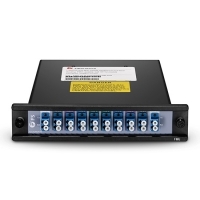 OADM is a cost-effective and easy to use passive fiber optic component, which can provide easy to build and grow connectivity environment for WDM network. 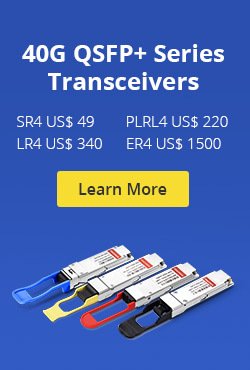 FS.COM provides full series of WDM MUX/DEMUX and CWDM OADM and DWDM OADM. Kindly contact sales@fs.com for more details. This entry was posted in How To, Network Solutions, WDM Optical Network and tagged CWDM OADM, DWDM OADM, OADM on November 16, 2016 by Alice Gui.